How do Students Use Library Books? As the circulation of print books by students continues to decline and access to e-books become ubiquitous, the library is working to develop monograph collection strategies that consider the impact of new technologies on reading styles, communication preferences and learning outcomes. The Library is seeking to understand how Hope students are using library books and which formats they prefer (print or e-books). The library will be conducting a brief in-person iPad survey to gather information about how students use library books. This survey is not asking about textbooks, only library books in the library collections. Students can take the survey Monday March 30 (today) through Sunday April 12. Look for it in several locations around campus including the lobby of Van Wylen, Cook Dining, Phelps, Cool Beans and the Martha Miller Rotunda. This survey takes less than 3 minutes to complete and students will receive a small gift for their time. The library is also conducting the HEDS Research Practices Survey for First Year and Senior students. This survey is conducted through the Frost Center via email. There are some great prizes for taking this one so if you are a First Year or Senior student, look for the email subject line Hope College Students: Share your experience with academic research. This survey runs through April 15. Posted on March 30, 2015 March 30, 2015 Author Kelly JacobsmaCategories eBooks, Library Highlights, Student NewsTags Books, eBooks, Survey, UsageLeave a comment on How do Students Use Library Books? 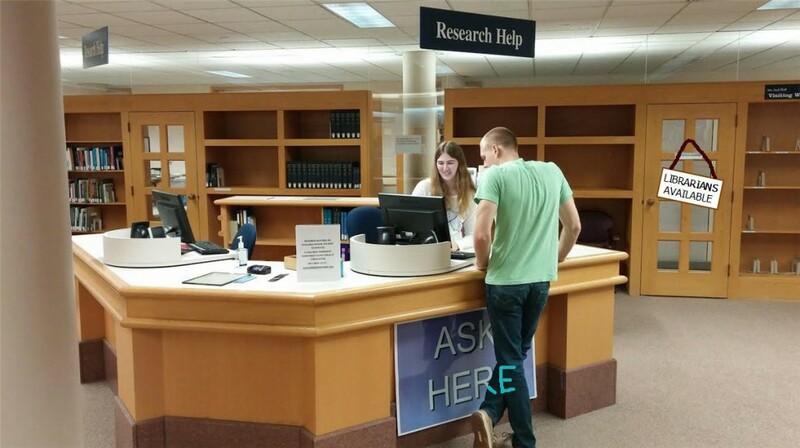 You may have noticed a slight change in the way search results are displayed in 1Search, Van Wylen Library’s 1-stop search stop. This 2.0-upgraded version is designed with the user in mind, making searches easier and more intuitive. Like before, the facets on the left allow you to refine your results by content type, discipline, publication date, and much more (see image below). 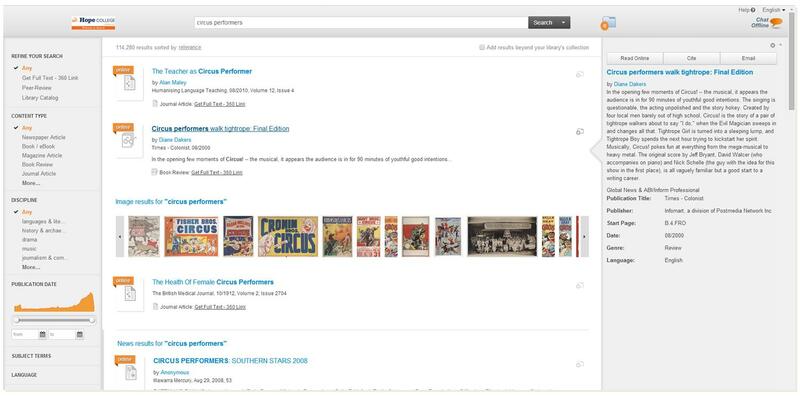 The search results are displayed in the middle, with clear indications as to whether something is available online or in print. News results are aggregated together, instead of interspersed throughout the search. Images are now clustered, as well, making them easier than ever to identify. Hovering over a search result displays summary and publication information on the right. You may choose to cite the result or email the citation from the right-hand search display. Advanced searching is still available by choosing the drop-down arrow from the search box. There are many ways to make your search experience fruitful using 1Search. As always, contact a librarian for any research-related help. Van Wylen Library is participating in a pilot collection called Knowledge Unlatched. What is KU? Essentially, it creates sustainable, open access to scholarly books with long-term savings for institutions by sharing the costs. Each institution that has pledged their support has acknowledged the need for new publishing models that give broader access to information while keeping costs at a sustainable level. This pilot program makes good research available to readers throughout the world. Once the program goal was reached, these titles were made available via a Creative Commons license. Records for each of the titles is available via HopeCat. Check back as more books are added to the collection. Currently, there are 19 titles available to be viewed. The 2014 Civil Rights Week is underway at Hope. Events sponsored by the Office of Multicultural Education will be happening throughout the week. On Tuesday, January 21 at 7pm in Dimnent Memorial Chapel, Dr. Gwendolyn E. Boyd, president-elect of Alabama State University, will be giving a keynote speech entitled “The Heart of an Activist: Grow Local, Think Global.” Learn more about speaker Dr. Gwendolyn E. Boyd in “Contemporary Black Biography, Volume 49.” Admission to all activities is free. The library has many resources that you can use to learn about civil rights. If you’re looking for scholarly articles, start with the database America: History and Life. Pictures can often be an impactful reminder of our historic struggle for civil rights. ARTstor has a host of images to help show us that history. As always, a quick search in the catalog yields hundreds of results for you to browse in print or online. If you’re interested in learning more, contact a librarian and we’ll get you the resource you’re looking for. Van Wylen Library offers a wide collection of resources that highlight many different subjects. Recently, new resources in religious studies have become available. The Greenwood Guides to Science and Religion, available from Credo Reference, give multiple options to find information on these subjects. These volumes can be accessed by any student, faculty, or staff with a Hope username and password. The essays in the Greenwood Guides address extensive information that question intelligent design, discuss the relationship of the roots of religion and its current path compare different religions, and integrate opinions and studies of professors specializing in science and religion. With critical thinking, they combine an analysis of many difficult questions, such as the concept of the mind without the soul, with the history of Liberal Protestantism, Islam, Evangelism, Catholicism and Judaism. These books provide many resources that will be helpful when seeking a historical analysis of religion. For more information on research in religious studies, be sure to start with the Religion Research Guide. Search the library catalog for religion subject books available in print and electronically.